The all year round health all-rounder. Sweet potato is one of the most reliable, versatile and nutrient dense foods to have in your kitchen all year round. In the Northern hemisphere the earth fruit is in season october through to December, but is available all year round as it can easily be stored for months if kept in in the dry and dark. Not to be mistaken with yam, sweet potato comes in a variety of shades from light yellow, through to purple and bright orange. The more colour the bulb contains, the more nutritious it is, read higher in riboflavin. Eating a medium sized sweet potato will supply you with more than your daily needs of vitamin A, and close to the daily dose of vitamin C. Interestingly, there is also a substantial amount of protein in sweet potato, as there is in most fruit and vegetables. So much for vegans being protein deficient. Use sweet potato as a savoury main or side dish by steaming or roasting, use in stews and curries, or as a replacement for the nasties that go in conventional sweet dishes - google sweet potato brownies recipe if you don't believe me. 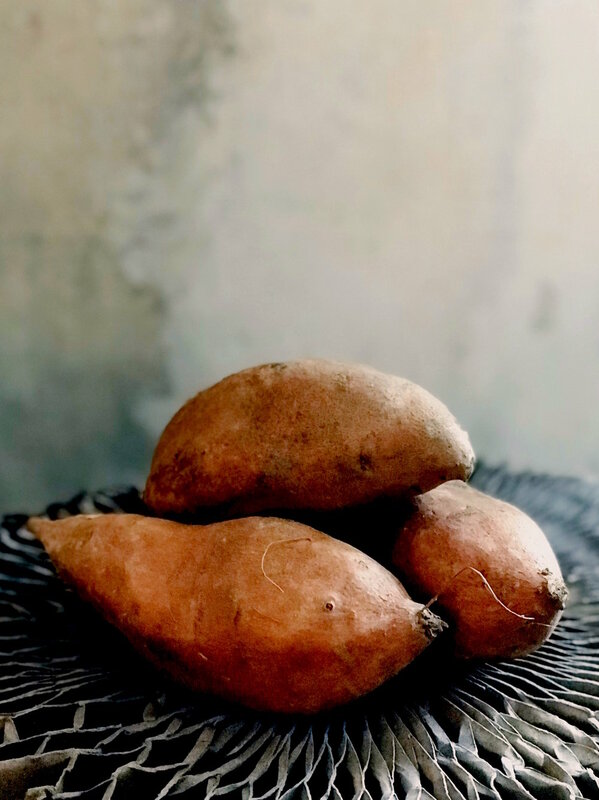 Sweet potato stabilises blood sugar, is rich in anti-oxidants, helps to boost brain activity thanks to its high B6 content, and is all round supportive of immune function. Sweeeeet!